The Lutheran Church of the Redeemer in Jerusalem was built on a historic site. Here you can go "Through the Ages" and explore archaeological evidence right up to the time of Herod the Great under the church nave. A museum in the cloister will give you more information on the history of the city. The church tower offers a magnificent view of the Old City of Jerusalem. The Lutheran Church of the Redeemer in Jerusalem was inaugurated on Reformation Day of 1898, in the presence of the German Kaiser Wilhelm II. In 1869 the Ottoman sultan had given the Prussian royal family a portion of the "Muristan" for building. 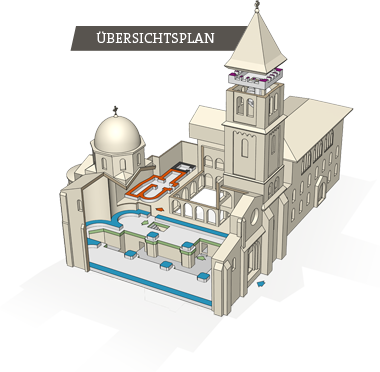 The Kaiser had the Church of the Redeemer built on the ruins of the Crusader-period church of St. Maria Latina (12th century) to continue the tradition. 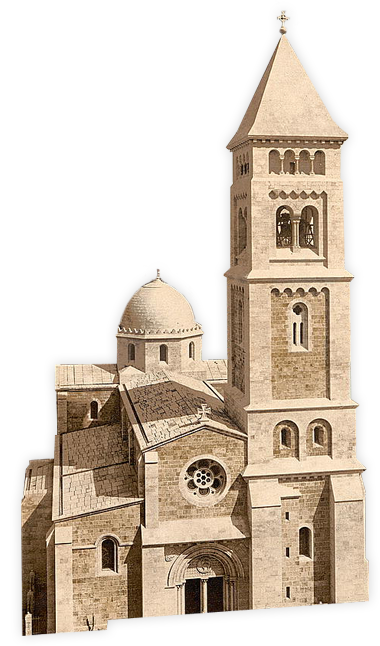 The Romanesque Revival-style church is today the centre of the German, Arabic, and other language-speaking Protestant churches in Jerusalem. Its present appearance dates to the renovations of the years 1970-1974. The medallion in the main apse and glass windows embedded there provide a glimpse of her former character. The immediate vicinity of the Holy Sepulchre had already played a key role in first archaeological investigations during the construction of the Church of the Redeemer in the late 19th cent. Back then it was thought that below the nave lay the old city wall from the time of Herod the Great (37-4 BC). This discovery ended the dispute over the accuracy of the location of Golgotha in the modern Church of the Holy Sepulchre. It seemed proven that the Holy Sepulchre (and with it Calvary Rock) had been outside the former city walls at the time of Jesus. During excavations conducted by the GPIA during the renovation of the Church of the Redeemer (1970-1974) it was revealed, however, that the walls found were actually houses that had stood to the south of the temple of Aphrodite from the time of Hadrian and the Church of the Holy Sepulchre built later on the same site by Emperor Constantine. An additional sounding cut to the natural rock did, however, confirm the old assumption that the site of the Church of the Redeemer and the Holy Sepulchre actually did lie outside the city walls in Jesus' time. From 2010 to 2012 the GPIA developed the place for access by tourists.